Wild: Thylacoleo furtimorsus is a large, powerful marsupial that can often be found hunting around trees. Its long claws and semi-opposable digits make it an apt climber, a quality that Thylacoleo uses to its advantage while hunting. It clambers up trees and waits to ambush passing prey by pouncing upon them. When something that large jumps onto a target, it becomes stunned and doesn’t stand much chance. Domesticated: Thylacoleo is a moderately strong mount, and its ability to climb trees makes it useful for traversal such that developing tribes often tame it. Small raiding parties particularly favor Thylacoleo, as it is well suited to ambushes and unfair fights! 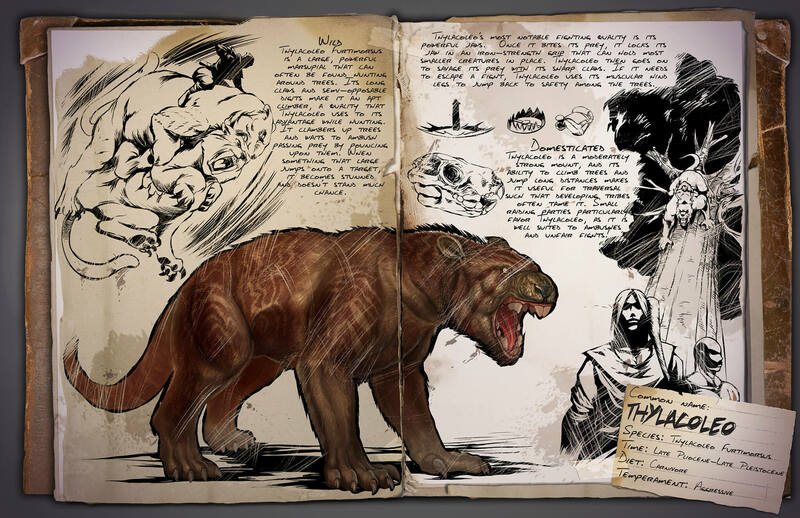 Known Information: Thylacoleo’s most notable fighting quality is its powerful jaws. Once it bites its prey, it locks its jaw in an iron-strength grip that can hold most smaller creatures in place. Thylacoleo then goes on to savage its prey with its sharp claws. If it needs to escape a fight, Thylacoleo uses its muscular hind legs to jump back to safety among the trees.